Long story short my family is made up of four girls (I am the youngest//not that that matters but just a tid bit) and we often try to get away either for a girls weekend every year or with the whole family at least once a year. I think that we have missed the last year (maybe even two) so the thought of making the time to get away together is very much on my mind. 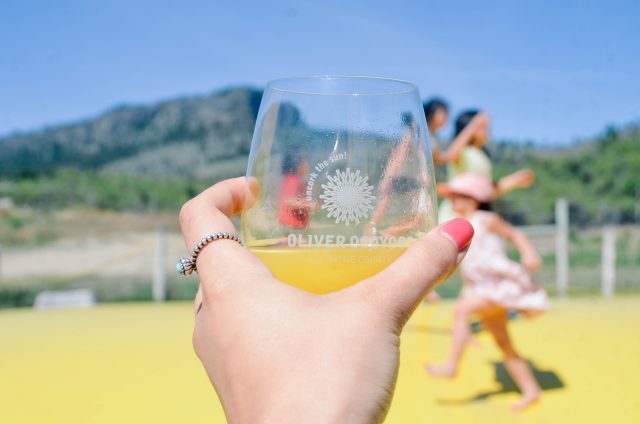 While lounging in the pool and walking the beach at Summerland Resort and Spa I was imagining just that, my whole family away on vacation with all of our kiddos enjoying the open air and quaint oasis that Summerland, BC offers. 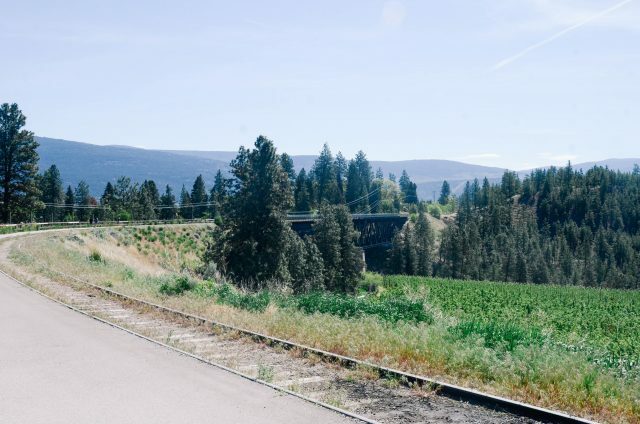 Throughout our trip we had the pleasure of exploring more of Summerland and it’s surrounding areas, we were given the opportunity to tour various places that were enjoyable for both kids and adults. Our family headed up a night early before meeting up with ten other Vancouver Bloggers and their families, special thanks to VancouverMom.ca. 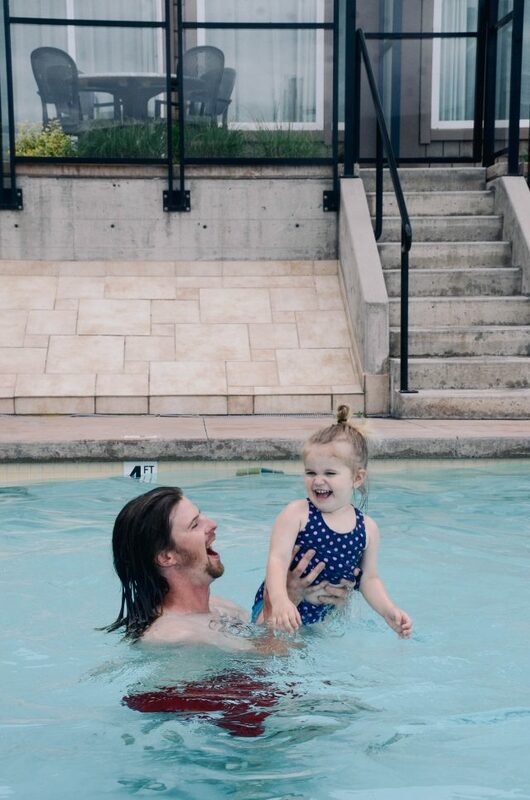 We took the day to relax, explore the resort and of course splash around in the pool even at the later hours of the night. The next morning we got ourselves together and were excited to explore Summerland with our tour guide from Authentically Okanagon (side note: Karen was our guide and she was incredible // highly reccomend her for families as her personality is SO amazing with kids). 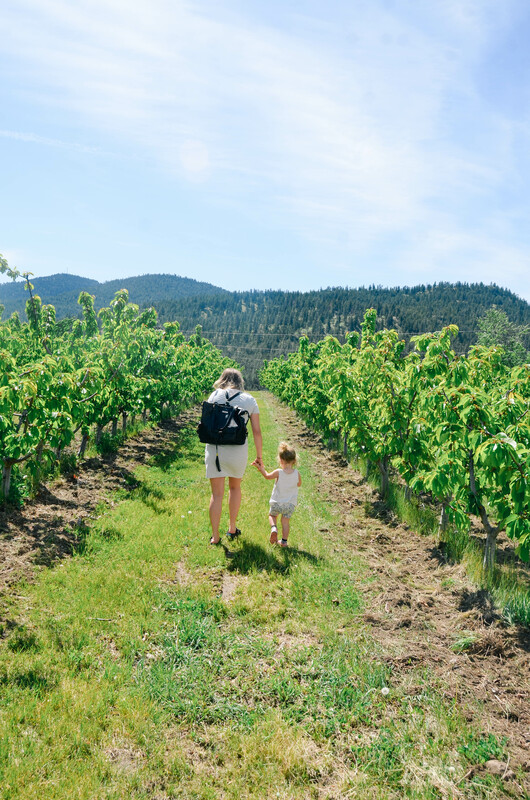 Our first stop was at OK Crush Pad, a 10-acre Switchback Orchard Vineyard that overlooks Okanagan Lake. Here everyone got to try out the different wines being offered, baby belly and I watched with a little bit of jealousy, soon enough it will be my turn again. ha! Karen took the kids down to see the ducks, chickens, and dogs that roam the winery. It was such a delight to see how much all of the kids were loving the pets. 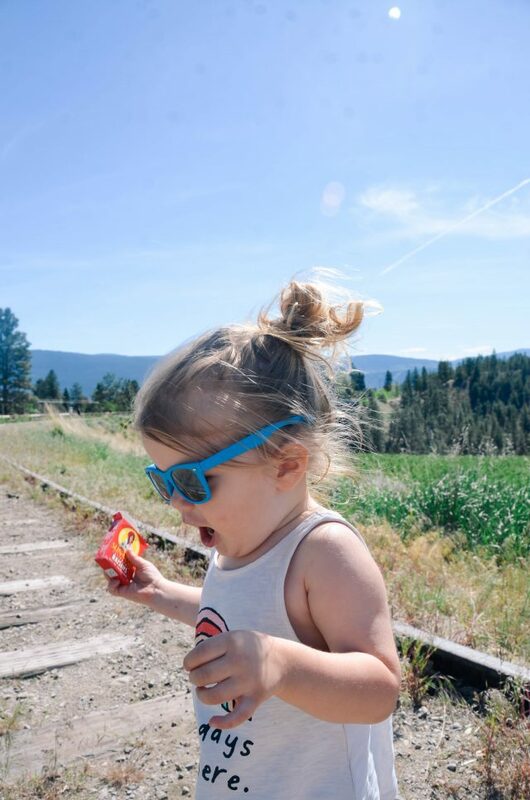 We took a quick pit stop on our way to Summerland Sweets at the nearby Kettle Valley Railway Trestles. The view was amazing and Sophie loved running down the overgrown tracks. 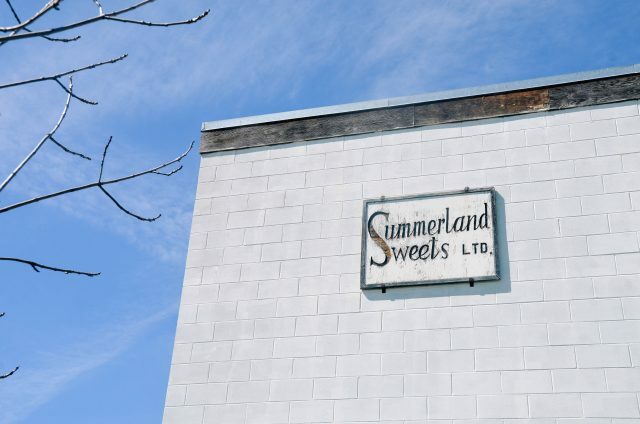 We made it to Summerland Sweets, which again was perfect for both the adults and kids. As our children were brought into the syrup tasting room the adults were in the next room trying out some of their syrup wines. The shopping here is right up my alley and I got to explore all the different syrups, jams and all sorts of other goodies that they had stocked on their shelves. We picked up a gift, did some exploring in the trees and were headed on our way to get icecream! During this pregnancy icecream has been a HUGE craving of mine, Tickleberry’s lived up to all of my expectations. We were warned that they are a popular place and that it is rare that you won’t have to wait in line a bit to get your icecream, but when you do get it, they do not disappoint. The whole family got to enjoy a delicious cone with the option to sit outside in the sun or in their shaded area. 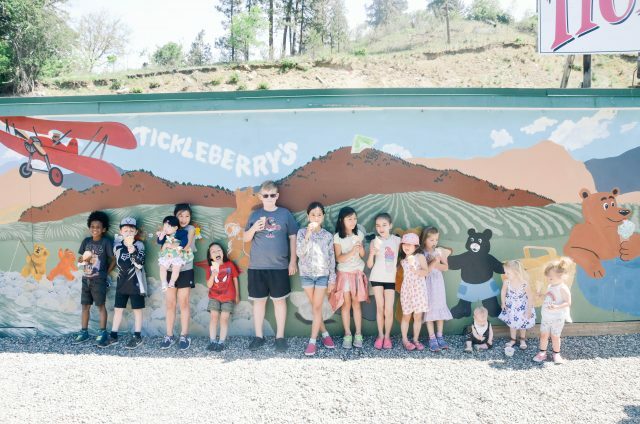 It was the perfect treat for the afternoon, if you are passing by Tickleberrys while in the Okanagan it is a must visit in my books. Last stop of the day was an afternoon spent at Osoyoo’s Pig Out Festival (the name speaks for itself really!) The hardest part was figuring out where to begin, as we walked past people we heard conversations like, “Oh did you try the tacos?” or “Wow that Chilli Bowl!” — I headed off to take the kids to the giant yellow pillow for bouncing and James took our plates to try out the grub! It was a win win, great food, drinks and playtime for the kids. What a day, the kids were pooped, Sophie had a nap on the way back to Summerland Water Front Resort & Spa in the car, our bellies were stuffed and we were all feeling so content. 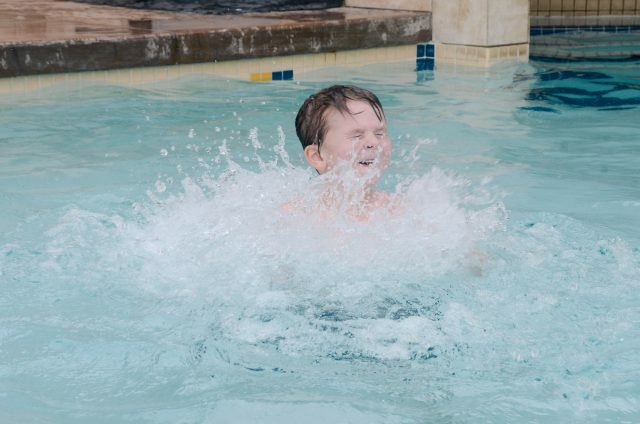 The day wasn’t over though, once we got back to the hotel the kids were eager to get themselves back into the pool and splash around some more. 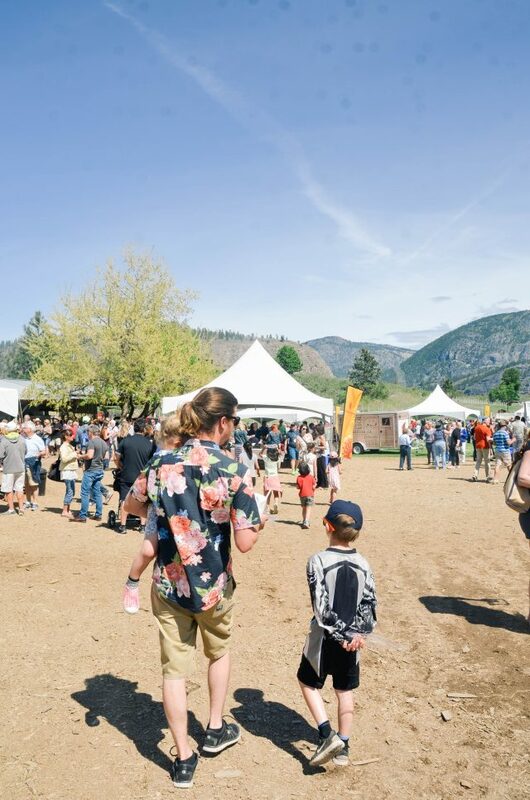 We were so impressed with how much there was to see in Summerland and it’s surrounding areas all in one day and loved seeing how much fun our kids were having exploring with us. Believe me when I say we will be back Summerland Resort, this is one family vacation that we would love to repeat.